My little sister and her friends recently moved into a house in my old neighborhood in Houston. 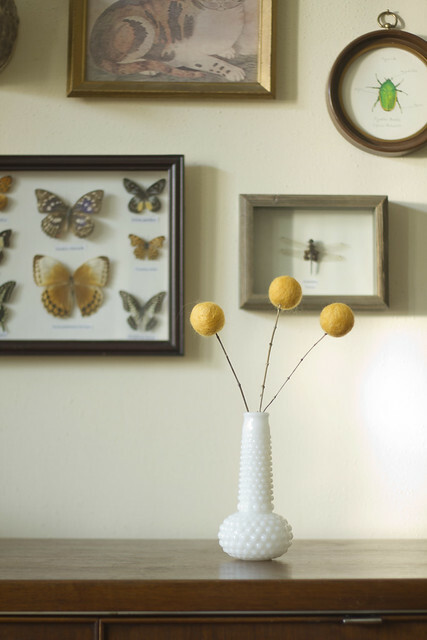 In lieu of a houseplant, I sent her some felt craspedia, otherwise known as billy balls. I was planning on writing up a tutorial on how I made them, but somebody already beat me to it. In addition to wet-felting, I went back with a felting needle to give them a little extra texture. And instead of floral wire, each is glued to the top of a long, thin stick. I also kept mine a little larger, for a more dramatic look. She also got the milk glass vase and a batch of rosemary shortbread, because it’s crazy good and it travels well. I love sending packages. – I’ve become increasingly obsessed with cake decorating techniques. More on that later. – I’m planning my thanksgiving dessert contribution with the help of this. – I spent more time watching this yesterday than I should probably admit. Posted on November 17, 2012 by Jessica This entry was posted in Crafts, Links. Bookmark the permalink. Sooo enjoying this post and your blog more generally, which I discovered today via Craftgawker. Thanks for all the inspiration! ha, they’d make some good ones!